Sodalite for Rock Tumbling - This Rough Polishes Great! 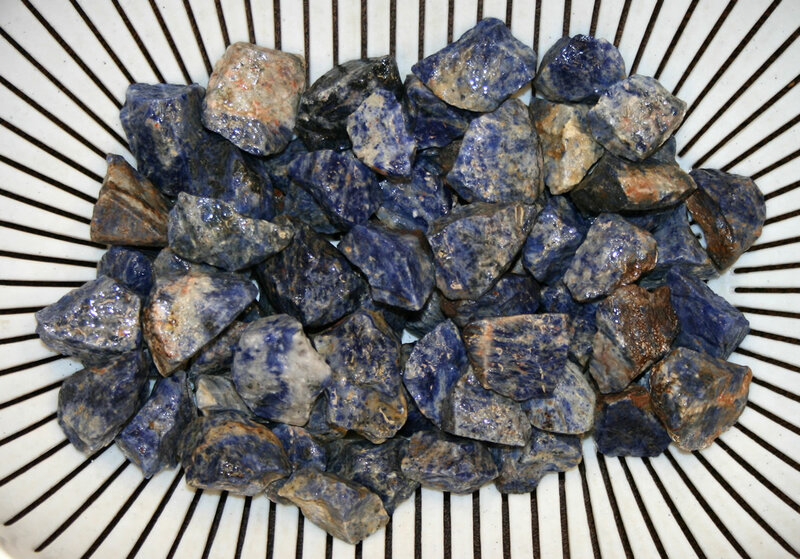 This image shows a 3-pound bag of sodalite tumbling rough, dumped into a colander and sprayed with water to reveal its full color. Click on the image for a larger view. Your tumbled stones are going to be a beautiful dark blue and white! Sodalite is a rare blue mineral found mainly in igneous rocks. Some rocks containing abundant sodalite can be polished to a beautiful luster and are durable enough for a variety of uses. When polished they often display attractive white patterns produced by other minerals dispersed through the rock. For these reasons and especially for its blue color, sodalite is valued as a gem material, ornamental stone and architectural material. The sodalite being sold here is in a rock from Brazil that also contains abundant white nepheline. Both of these minerals have a hardness of approximately 6 on the Mohs hardness scale. That gives the rock a uniform hardness that will perform well in a rock tumbler. The tumbled stones produced will have an appearance dominated by dark blue sodalite with fine markings of white nepheline. This rough can also be used to cut nice blue and white cabochons. Some people make tumbled stones then pick the ones that can easily be sawn into thin slices for cutting small cabochons - or just tumble the slices for nice ovid gems that are perfect for earrings, pendants, cufflinks, game pieces and more. 1) Shapes Quickly: This Sodalite is an igneous rock from Brazil that is composed mainly of blue sodalite and white nepheline, with minor amounts of a few other minerals. Sodalite and nepheline both have a Mohs hardness of about 6 so they should shape faster than the agate, jasper and petrified wood that most people tumble - and that have a Mohs hardness of about 7. For that reason, we suggest tumbling Sodalite for less time during the coarse grit step of the tumbling process. 2) Media Needed: This Sodalite ranges in size between about 1" and 2". For that reason, ceramic media should be added to fill the voids between the large pieces of rough. These will provide a smoother tumbling action and deliver grit to the surfaces of the larger pieces of Sodalite. We would tumble a mixture of about 25% media and 75% Sodalite. Additional media should be added after the first tumbling step if the barrel volume drops below recommended levels. If you would rather purchased sodalite that is already tumbled we have some very nice stones in medium size, available by the pound here.